Monday's Public Hearing on Jim Righeimer's Charter is a gift that just keeps on giving. Today, imported shill Kevin Dayton - the guy who almost incited a riot - produced a commentary that is published online in the Daily Pilot, HERE, and will also appear sometime in the next couple days in print, according to the editors. 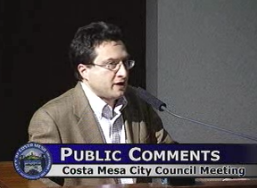 "To the Costa Mesa police force: Thank you for your professionalism during the "near riot." You balanced the rights of the people with the need to restore order. The city should be proud of you." We SHOULD be proud of the officers in the auditorium that night because they displayed professionalism and restraint in a situation that could have gotten very nasty. So, after you read Dayton's epistle, take 9 minutes again to watch him in action at the council meeting Monday night. Pay particular attention to the last few seconds of this clip. What you don't see is his antagonistic posturing as he approached his seat. He looked EXACTLY like the critter in the image I've provided for your viewing pleasure. Clearly, this is probably not the last we've heard from him as he pontificates on issues in which he has no vested interest from the safety of his bunker in Sacramento. Last Monday evening 4/5ths of the Costa Mesa City Council - Mayor Gary Monahan apparently made a tactical decision to stay home or at his bar while Mayor Pro Tem Jim Righeimer orchestrated the evening - went through the charade of "hearing" what the public had to say about Jim Righeimer's Charter scheme for the final time. More than 40 people stepped up to the speaker's podium to address the issue, most of whom were Costa Mesa residents - or said they were. Most spoke with passion and some actually presented solid facts and suggestions for modifications to Jim Righeimer's Charter. If you're interested in just how the evening went from start to finish, you can watch it HERE, or you can watch it on Channel 24 (Time Warner Cable) or Channel 99 (ATT U-Verse) at the times shown below through the rest of the month. 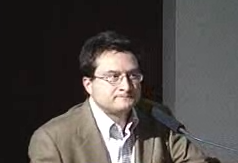 There were MANY excellent speakers - too many to try to provide clips for all here. However, I think resident Perry Valantine may have captured the essence of many speaker's comments with his three minutes before the council. Please take those three minutes and watch this clip. The most controversial segment, as was reported broadly in the "real" media and here, as well, was the extended presentation by Kevin Dayton, who described himself as being from the "Dayton Public Policy Institute" - an organization that is either too new to have ANY presence on the web or else it just exists in his head. According to Righeimer, he "contacted us" earlier and asked to make a presentation on the subject of Prevailing Wage. And with that Righeimer let him launch off into what turned out to be nearly 10 minutes, which culminated in him being jeered from the speaker's podium, shouting "Fascism! Fascism! Fascism!" as he stepped away. Not visible in the video clip below was his antagonistic posturing as he returned to his seat, which I described as a "You want a piece of me?" pose. Kevin Dayton is Vice President of Government Affairs for the Golden Gate Chapter of Associated Builders and Contractors (ABC). Since January 1998, Mr. Dayton has developed and implemented strategies for Northern California construction companies to advance free enterprise and open competition. From 1995 through 1997, Mr. Dayton managed the Political Action Committee and grassroots programs at the Associated Builders and Contractors headquarters in Washington, D.C.
Mr. Dayton was a Legislative Assistant for U.S. Representative Gary A. Franks (R-CT) from 1992 through 1994. He is a graduate of Yale University. As he spoke Monday night it became clear that he had a "history" with some of the more vocal members of the audience. To get the feel for that part of the evening, which resulted in Righeimer calling a time out - a 10 minute recess - please watch this short, 9 minute clip. As I said in my earlier summary of events from that evening, it was clear that Righeimer was NOT going to let any substantive changes be imposed on HIS Charter. He permitted a modification to the Preamble, which was nice but benign. The rest was just window-dressing. The proof will come on March 6th, when the council votes to place Jim Righeimer's Charter on the June, 2012 ballot. We have now passed the point where any additional safeguards can be added. On March 6th only items can be deleted from the draft charter. That is not going to happen. We should see the latest version online today or tomorrow, according to what city staff tells us. So, take some time over the weekend or next week and view the tape, read the final version of the Charter and you'll understand why this is such a bad idea. Late this afternoon the City of Costa Mesa posted a link, HERE, on the home page that takes you to a spreadsheet displaying the City's legal expenses for this fiscal year, through December, 2011. Before you click on that link be sure you're sitting down and have a seat belt fastened. According to this bit of information, the City has paid a total of $1,169,339 in legal expenses for the first half of the fiscal year. The total for expenses coming out of the General Fund is $428,259. You will recall that the General Fund budget for legal fees beginning July 1, 2011 was $803,000, so we're well on our way to blowing through that amount. Of greater interest, perhaps, is the amount of money being rung up for litigation. That accounts for $730,360, or over 60% of the City dollars spent on legal expenses! Of that amount, the high-priced firm of Jones Day - the $495 per hour firm being used for the CMCEA litigation - accounts for more than half, $390,701, and that ball's just beginning to roll now. My understanding is that they've begun depositions, which will get that old meter spinning. I've written to contract City Attorney, Tom Duarte, today for an explanation of how they determine specifically which expenses are charged against the General Fund and which are charged to our Self Insurance Fund. I expect I'll hear from him sometime Wednesday on this subject. The Self Insurance Fund was budgeted for just over $3 million for this fiscal year. **NOTE: I heard from Bill Lobdell, Director of Communications for Costa Mesa, this morning. He confirmed that those numbers shown under "litigation" are just that. Jones Day numbers will ALWAYS appear in that category. Once again the Costa Mesa City Council held a Public Hearing on Jim Righeimer's Charter scheme Monday night and, despite dozens of speakers offering suggestions for changes, the council demonstrated that "hearing" is not "listening". The meeting, which ran more than four hours if you include the break that was taken right around 8:00 when a near-riot broke out, turned out about as I expected it would. The council took comments from 41 people - nearly 80% of which spoke against the Charter - haggled among themselves about which phrases would be added or deleted, stiff-armed Wendy Leece at virtually every turn and adjourned the meeting shortly before 11:15 with Jim Righeimer's Charter virtually intact. All that remains now is for them to vote to place it on the June ballot at their meeting on March 6th. Last night speaker after speaker rose to either oppose Jim Righeimer's Charter flat out or to request the council to slow the process down and place the Charter on the November ballot instead of jamming it down our throats. 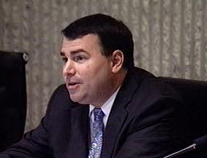 At one point, during his response to that suggestion, Righeimer told the audience that if the Charter failed at the June election it would simply be placed on the November ballot. So, not only is he willing to spend between $97,500 and $123,500 to place it on the June ballot, but he's willing to virtually double-down and spend another $78,500 to $97,500 in November. Of course, it doesn't surprise me that he's willing to spend taxpayer's money like that - he and his pals on the council are spending legal dollars like the proverbial drunken sailor. It won't surprise me at all if the total legal fees this fiscal year top $2 million so far. We budgeted $800,000. Several speakers reported that they had either NOT received the pro-Charter m ailer yet, or received it late Saturday, providing precious little time to become familiar with the issue. According to CEO Tom Hatch, that document was produced by city staff and cost $9700, including mailing. It apparently was sent to every household that receives the quarterly Recreation Report. And, we managed to kill a small forest with the 134 pages of staff report and related documents for the 175+ members of the public who attended the meeting. Perhaps the most interesting part of the meeting was the presentation by a fellow named Kevin Dayton, who told us he represented the Dayton Public Policy Institute. This outfit, according to Dayton after he was jeered away from the speaker's podium, is brand new - he had no web site nor business cards - and is apparently just him. You can read Joe Serna's account in the Daily Pilot, HERE. Before he began speaking it was clear that he had pre-arranged for an extended stay at the podium, acknowledged by Righeimer, who was running the show because Mayor Gary Monahan was, again absent. As he went on and on, providing "guidance" to the City Council - some of which they eventually folded into their modifications of the current draft of Jim Righeimer's Charter. Eventually, at about the seven minute mark, many members of the audience began to get restless and started to call out "Three Minutes!" 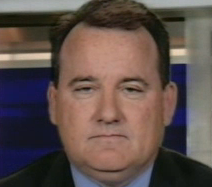 and other less flattering comments. Apparently Dayton has a history with some of the union members in the audience. Eventually, at the nine minute mark, things got raucous and Righeimer called for a short break and Dayton exclaimed "Fascism, fascism, fascism" as he left the podium. As he approached his seat - and the police officers converged on his location to maintain order - Dayton spread his arms out wide in a taunting gesture, a "You want a piece of me?" posture, to those several dozen burly, vocal members of the audience who continued to jeer him. I've never seen this kind of activity at council meetings in the past, and, in my opinion, Righeimer precipitated it by allowing Dayton to speak so long, antagonizing an already-hostile audience. I knew we wouldn't see any substantive changes to Jim Righeimer's Charter last night, but I was surprised that we would get such a clear and obvious example of what life will be like in Costa Mesa if the Charter passes in June. Righeimer ran the meeting with his typical disregard for the rules. His allowance of nearly 10 minutes of speaking time for Dayton was only one example. He tired very quickly of Wendy Leece's attempts to get segments deleted and/or added. He and his cohorts, Eric Bever and Steve Mensinger, just kept on sniping at her and failed to provide a second to her motions. She did succeed in having the Preamble modified, installing segments plucked from Huntington Beach's charter and inserting them in the draft, but only after the intervention of resident Perry Valantine, who had recommended the changes in the first place. A predictable, and pathetic, segment of the meeting last night was when Planning Commissioner and Righeimer/Mensinger lap dog, Jim Fitzpatrick, stepped up to the speaker's podium early-on and heaped praise on the council for their bravery and foresight. The crowd tittered and then grumbled as his shameless pandering continued. When he finally finished I felt like someone should offer him a tissue to wipe that brown stuff off his nose. So, now we wait three weeks, until the March 6th council meeting, at which time they will almost certainly vote to place Jim Righeimer's Charter on the ballot. Then the battle begins. There is already very significant organized opposition to this scheme. The group Costa Mesans For Responsible Government is already mobilized and promises to produce a cadre of activists to go door-to-door to inform the public about this disaster. It's going to be a very interesting spring. 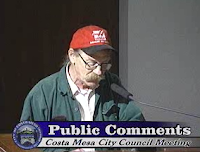 That's the number of so-called "informational meetings" the City of Costa Mesa has had for our residents on the subject of Jim Righeimer's Charter scheme. I say, "so-called" because not much information was provided to those residents who actually heard about it and attended. 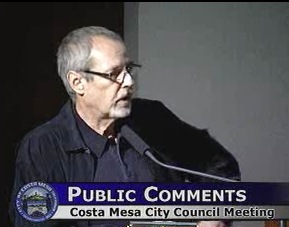 Counting the meeting Monday, that's the number of official public hearings the City of Costa Mesa has had on Jim Righeimer's Charter scheme. It's also the number of despicable council members who accused retired City Manager Allan Roeder - who served Costa Mesa with distinction for more than three dozen years - of feathering his own nest intentionally so he could fluff-up his retirement, which was to follow three years hence. At least four - that's the number of times Righeimer has told folks in public meetings that if we had a Charter all our nasty legal entanglements would disappear instantly. And, of course, he's never told us how that works. As I read the rules, existing contracts and obligations remain. If that's not the case, contract City Attorney Tom Duarte needs to tell us exactly how the city is absolved of following through with current legal problems. We can't make an informed choice in the voting booth without that information. That's the number of weeks late the informational Charter Mailer sent out by The City last week was tardy when it finally arrived in resident's mailboxes. As of Sunday night many correspondents are reporting still not having received it. That's what time the meeting begins tomorrow. 7:00 p.m. in City Council Chambers at City Hall, 77 Fair Drive. That's the number of days we will have following Monday's hearing before the City Council votes, on March 6th, to place the Charter on the June ballot. That's the decrease in Police Department staffing imposed by this City Council, arrived at by simply pulling a number out of the air and ignoring their own consultants and interim police chief's recommendations. Those are the kinds of decisions this council makes WITH state rules in place. Think what will happen if Jim Righeimer's Charter is passed and state regulations in place to protect residents from capriciousness and corruption of council members can be ignored and they can just make up the rules as they go along. That's the boiling point of human blood at sea level, or how some of us sometimes feel as we watch members of the City Council misrepresent the facts of Jim Righeimer's Charter scheme. That's the increase in senior managers in the Chief Executive Officer's office compared to the number in Roeder's City Manager's office a year ago. And that's not even counting all the consultants! 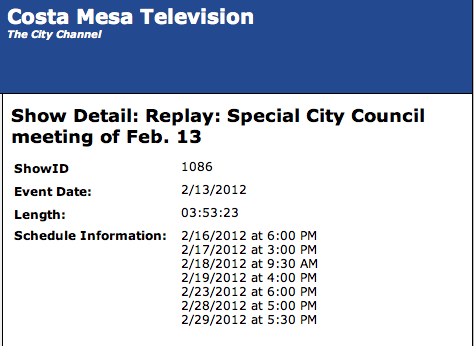 That's the monthly rate for Costa Mesa City Council members. You'll remember that number because Righeimer used it in this twenty second video clip last week, although he really wasn't that precise. As usual, close counts for him when it comes to numbers. That's the number that Righeimer and his sycophants like Colin McCarthy keep throwing around as the unfunded pension liability that the city is on the hook for because of our "greedy union workers". They neglect to mention that we don't have to come up with that number tomorrow - that's the ultimate payout spread out over decades, unless the City withdraws from CalPERS, in which case the number is nearly doubled. That's the number of senior city staff managers in their jobs today that held the same position a year ago. The loss of institutional knowledge and experience created when this City Council, by establishing a hostile workplace, chased out senior managers and staffers who were unwilling to sit by and watch this city government be dismantled by thoughtless, inconsiderate, self-centered political opportunists. What will they do when they can make the rules? Our friends over at the Costa Mesans For Responsible Government, HERE, have provided a counterpoint to the position taken in the City mailer - that you MIGHT finally receive in the mail on Monday. This group has been paying attention and provides some interesting information HERE. Monday is the time to step up and speak up if you want to have a voice in Jim Righeimer's Charter scheme. It will be your last shot before this council installs this flawed document that will be intended to guide this city into the future. You've seen the damage they have done over the past twelve months. Are you ready to give them even more weapons with which to destroy this once-proud city? If not, speak up! OK, no football this weekend, so, for those in need of some excitement, I happily present to you the final few seconds of the recent Estancia/Costa Mesa boys basketball game. Costa Mesa TVs Brad Long provides the pictures and Dane Bora calls the action for you. If you want to watch the entire game just click HERE.